If you’re an American citizen, you might think that you have the right to create whatever art you want, no matter how offensive, without facing the threat of criminal prosecution. After all, it’s the first amendment for a reason, right? Well, you would be wrong. The new documentary Boiled Angels: The Trial of Mike Diana, offers a horrifying look at how easily the law can be turned against a transgressor in the right circumstances. If you’re familiar with Frank Henenlotter’s work as a filmmaker, you probably know him best as the exploitation auteur behind films like Basket Case and Frankenhooker, but with Boiled Angels, the director brings his hucksterism spin to the documentary realm via the story of the only American artist to ever be convicted on obscenity charges. The artist in question is Mike Diana, a name that will be familiar to comic book diehards, but oddly enough, not to most Americans, who will no doubt find themselves shocked by both his work, and even more so, the charges levied against him in the American courts. Directed by Henenlotter, featuring art work from Diana himself, and plenty of testimonies from Diana, fellow artists, and legal figures on both sides of the case, Boiled Angels recounts the incredible story of Diana’s artistic development, his emergence on the underground comics scene, and the court case that ultimately saw him thrown in jail for obscenity… all because he published some grotesque imagery that violated the sensibilities of enough Floridian power players. Let’s back up a little. Following the establishment of the Comics Code Authority in the 1950s — a conservative means of content restrictions in with rules like “Crimes shall never be presented in such a way as to create sympathy for the criminal”, And “romance stories shall emphasize the value of the home and the sanctity of marriage” — the experimental, transgressive age of comics was quashed taking institutions like EC Comics down with it. And the code lasted for decades, setting the stage for Diana’s mid-1990s trial. 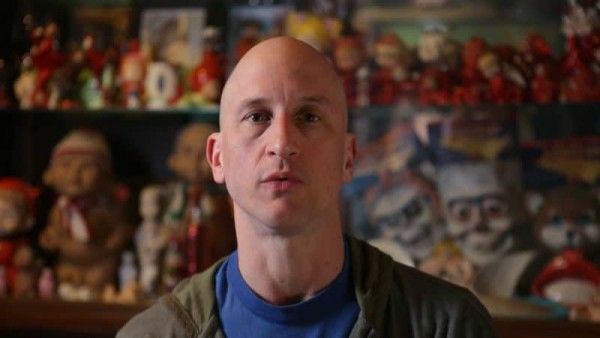 In the aftermath, the underground comics scene arose, allowing creators to peddle their wares via unconventional means, aka head shops and direct subscriptions, which is where the young Mike Diana got his start as an artist. Distributed to a few hundred readers from his home in Largo, Florida, Diana’s transgressive comic Boiled Angel quietly chugged along until officers noticed some similarities between Diana’s work and the horrific Gainesville murders, and suspected the two might be connected. They weren’t — Danny Rolling was convicted and executed for those crimes — but the connection put Diana on the radar and the Florida police were determined to take down the teenage peddler of illicit imagery. From there, the case grew, gaining national attention (for a time), and with the help of some determined young attorneys, a seemingly biased judge (who by many accounts actively subverted the defense during the trial), and a heap of outrage, Diana was brought up on charges of obscenity that had staggering ramifications for the young artist; an egregious violation of American justice with a shocking sentence that saw Diana briefly jailed, and worse yet, forbidden from creating art — with the threat of police swooping in on his home at any hour to make sure was drawing(!!!) — and prohibited from coming within 10 feet of minors.